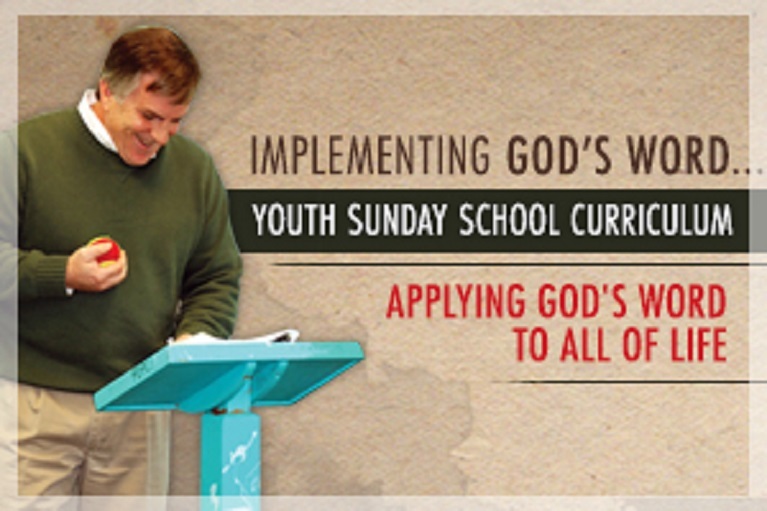 Implementing God’s Word… is a six year, Christ-centered and Gospel-Driven Sunday School curriculum for Middle School and High School students. Each quarter includes 13 lessons for a total of 52 weeks each year. To learn more about Implementing God’s Word… please read about the curriculum sequence, distinctives, and components--and download any or all sample lessons. This series can be easily adapted for use as a Middle/High School Homeschool Bible curriculum! Year One: Biblical Worldview	Available Now! Year Two: Biblical Relationships	Available Now! Year Three: Old Testament Survey	Available Now! Year Four: New Testament Survey	Available Now! Year Five: Christian Apologetics	Available Now! Year Six: Biblical Counseling Available Now! We believe that all Scripture, in both the Old and New Testaments, has Christ as the central focal point. With that in mind, we teach all of Scripture to our youth with clear reference to Christ. Each lesson should direct our minds to what we learn about who Christ is, why we need Christ, and what it means to be Christ’s disciples. In other words, the gospel of our Lord Jesus Christ is taught as the youth study all of God's Word. As has always been the case, the greatest need for our youth (after salvation) is WISDOM. They need to know how to act upon what Scripture says. They need to have their minds renewed, and grow in knowledge and wisdom. They need to learn and live the truth! Building on a solid foundation of the stories of Scripture, young people need to be able to systematize the truths found in Genesis through Revelation. Their studies are more topical and thematic in nature, but that doesn't make them less Biblical! They are shown that Scripture is the foundation for what we believe about God, ourselves, other people, and the world around us. Essentially, all of the curriculum is about the task of building their Biblical worldviews! The methodology of our curriculum is the verbal transmission of God’s Word. Teachers converse in a highly interactive way with their students about God’s Word. Scripture is read, questions are asked, discussion is engaged, and application is made. Within this process, students learn to investigate God’s Word—observing, comprehending, interpreting and applying it. It is our desire to see young people learn God’s Word AND learn how to study it for themselves. We desire for teachers and their students to be captivated by God’s Word. Therefore, we have minimized the “extras” often found in youth curricula in order to make the most of their time in God’s Word, and in Biblical thinking and application. There are no worksheets, journals, or skits. Teacher and students spend their time implementing the Bible, so they learn God’s Word, love God’s Word, and begin to live out God’s Word! Our curriculum is a clear and organized scripted lesson plan, making it easy to prepare and present. The main preparation is of the heart! Teachers are not given multiple options or extra activities to put together. This allows the focus to truly be on God’s Word, as it has the power to change the hearts of our young people. Our teachers testify to learning along with the youth as they investigate God’s Word together! The first page of each lesson includes a summary of the topic/theme being studied as well as some words of encouragement for the teacher. A suggested schedule for the class is included in the sidebar. Teachers get an overall view of what they will be teaching and some Biblical motivation to teach God’s Word with passion! Each lesson begins with a welcome which introduces the students to the day’s study. We like to think of it as a “call to study.” The WELCOME section is typically a verse or two from Proverbs and a challenge to seek wisdom. The DRILL TIME is the weekly opportunity for the students to be quizzed on what they have learned in the past. Most of the time, the questions come from the week before. The DRILL TIME helps to ensure that our children are reminded of Biblical principles that they have learned in the past. The MIND-IN-TRAINING section is designed to train the students how to THINK. This element teaches a Biblical view of knowledge and the mind, as well as useful tools to engage their thinking. The BIBLE IMPLEMENTATION time is the heart and soul of the weekly lesson. It takes the students throughout God's Word, systematically tying it together to build a Biblical Worldview. All Scripture texts are in the teacher's manual, and are from the English Standard Version (ESV). The Bible reading is taken in short sections, separated by times of discussion and application. This format allows ample opportunities to stop, think about and discuss what is being read. At the end of each lesson, the students are challenged to ACT on what they have learned. As their young minds grow in knowledge, it is vital that they also act wisely. They will never truly learn God's Word if they don't passionately implement God's Word in their lives. What version of the Bible is used in the Sunday School curriculum? The English Standard Version (ESV). Why is the curriculum divided up into years rather than grades? The curriculum is designed to be used for 7th-12th grade. But rather than dividing them into grades, we chose to put them into more generic “years” for greater flexibility and broader use. More importantly, this allows you to use the curriculum for classrooms of multiple grades, rotating years as needed. Your Sunday School curriculum seems more expensive than others. Why is that? Our Sunday School curriculum is printed on high quality paper and bound in order for you to use them year after year. While most Sunday School curricula is consumable, it is our hope that you can use these volumes for several years without the need for replacements. Also, with our curriculum, there are no consumable workbooks or worksheets for you to buy each year for each child. So, in the long run, you will end up saving money by not having to buy more material each year. Do you plan to publish the curriculum in other Bible versions? Can we make copies of Sunday School lessons? Individual lessons may be copied for single use, such as for substitute teachers. The curriculum is copyrighted and may not be copied into complete books. We’re sorry, but at this time no refunds are given for unwanted curriculum. Of course, if you receive a defective item or the wrong item, we will promptly ship you a replacement. You can download the Scope and Sequence of Year One by clicking here ,Year Two by clicking here , Year Three by clicking here., Year Four by clicking here, Year Five by clicking here, Year Six by clicking here. These are in a PDF format. You will need the Adobe Acrobat Reader (or compatible program) to view the Scope and Sequence document.